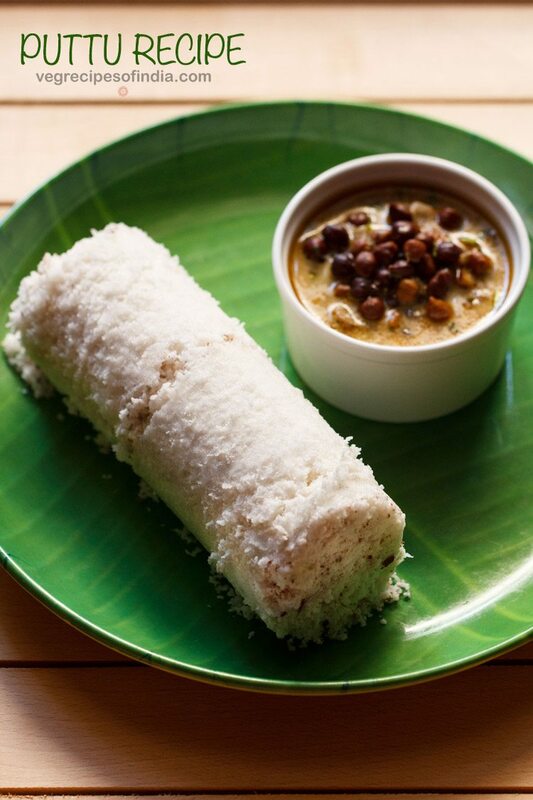 puttu are basically steamed rice flour and coconut logs. 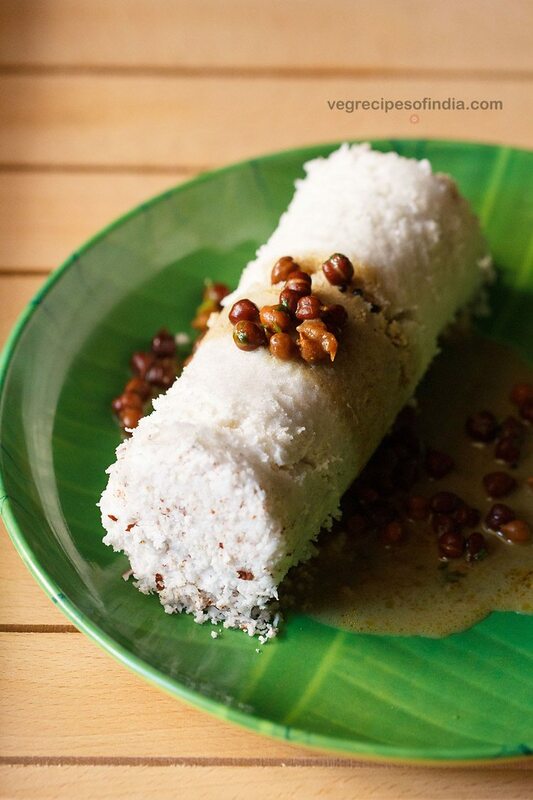 puttu served with kadala kari is one of the most popular breakfast from kerala. puttu recipe with step by step pics. puttu served with kadala kari is one of the most popular breakfast combination from kerala. 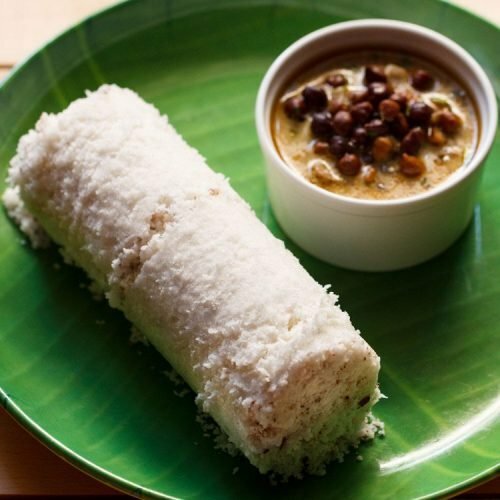 puttu is basically a steamed rice flour and coconut log. the combination of soft puttu with kadala kari (black chickpeas curry) is awesome and you should taste it to know what i mean. traditionally puttu was made in bamboo logs and this gave the puttu a lovely aroma. puttu is a heavy breakfast and keeps you full for some time. i make puttu occasionally. so the day i make puttu i also make kadala curry. i have used puttu podi available in the markets to make puttu. 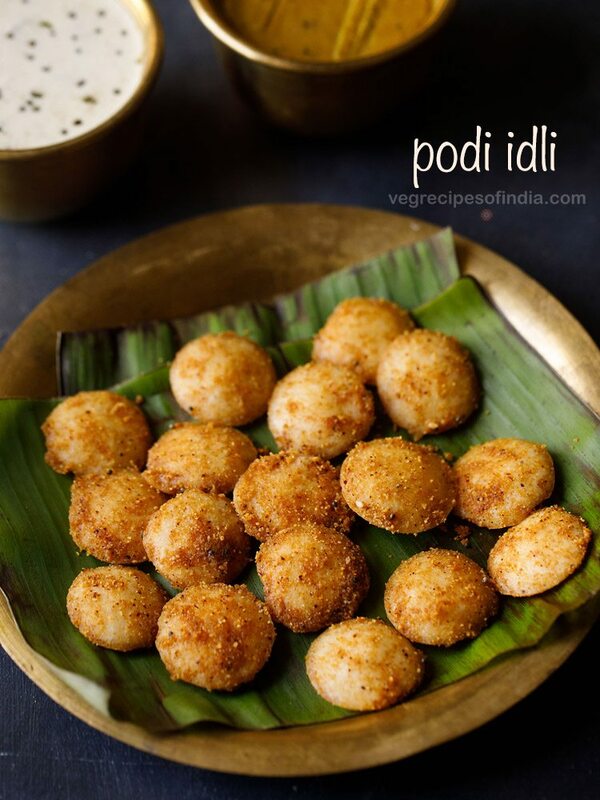 putti podi is coarsely ground rice flour. you can even use store brought rice flour too. 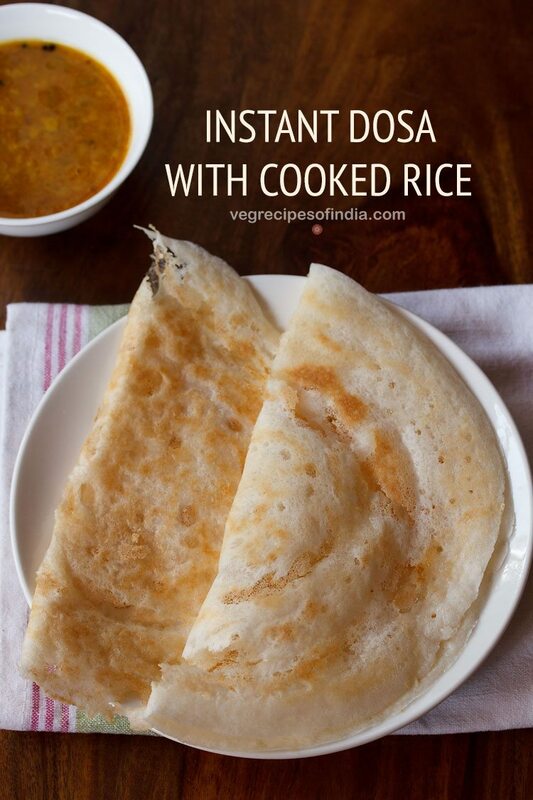 just roast the rice flour lightly till you see steam coming from it before making puttu. 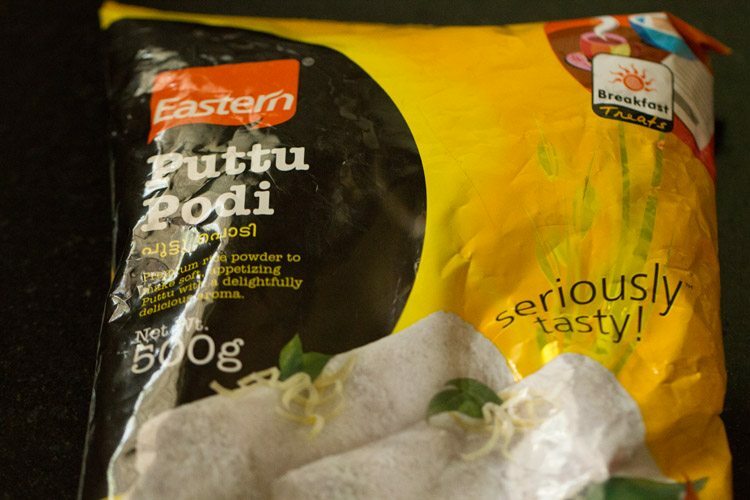 to make puttu, you will need puttu kudam. puttu kudam is a puttu maker or a puttu vessel. it consists of two parts. the base part is for heating water. the top cylindrical part is for steaming puttu. 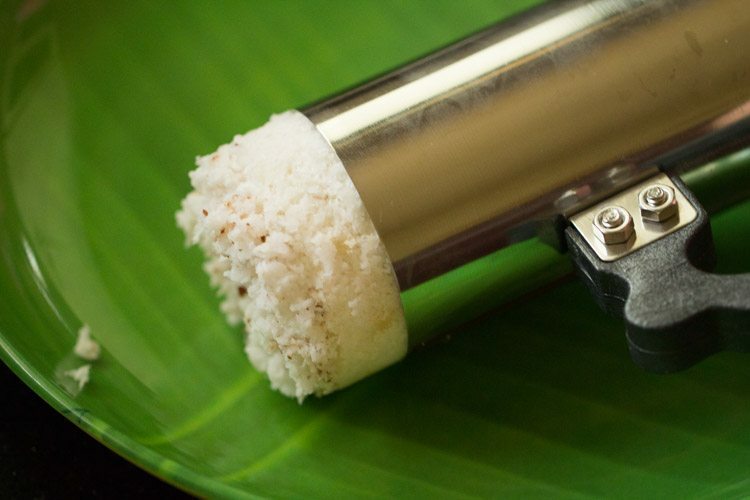 without a puttu kudam, puttu can be easily made in an idli pan. puttu can be served with kadala curry or even a veg stew or potato stew. we also have puttu sprinkled with some sugar and banana at times. if you are looking for more recipes from kerala cuisine then you can check varutharacha sambar, unniyappam, ulli theeyal and pazham pori recipe. 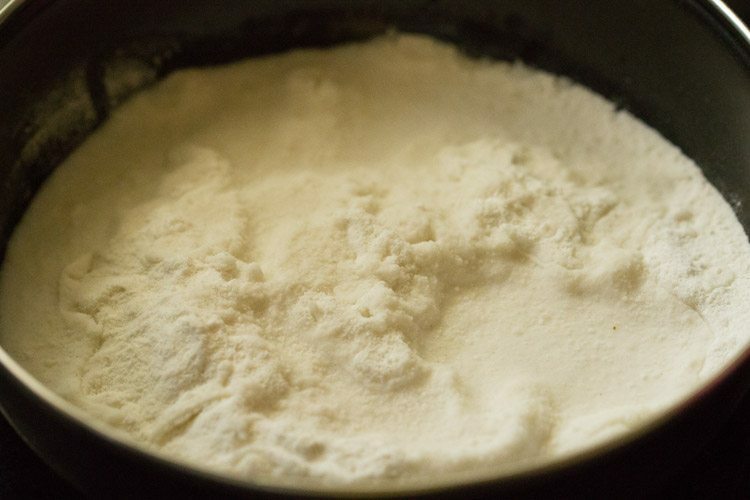 take 1 cup puttu flour in a mixing bowl or a pan. add ⅓ teaspoon salt or as required. now sprinkle ⅓ cup water all over. 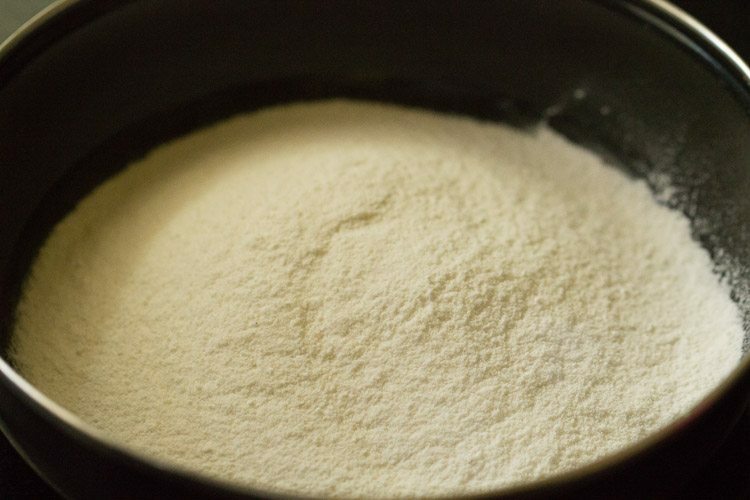 the amount of water required will depend on the quality of rice flour. so you can add accordingly. 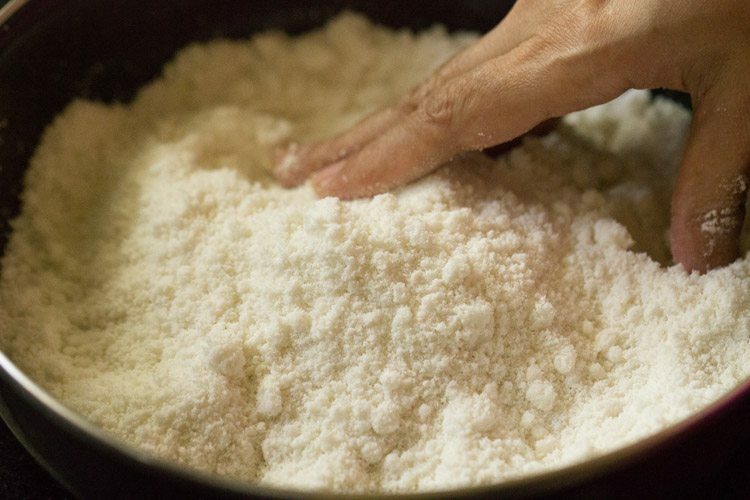 begin to mix the rice flour with the water with your fingertips. to get soft puttu, the amount of rice flour to water ratio is important. to check this gently press a small portion of the flour between your palms. it should form a lump. when you press this flour lump more, then it breaks and crumbles. 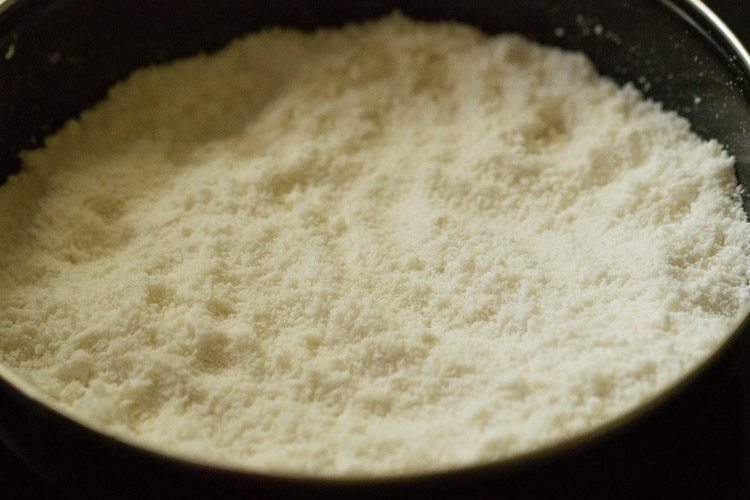 this should be the texture of the flour. 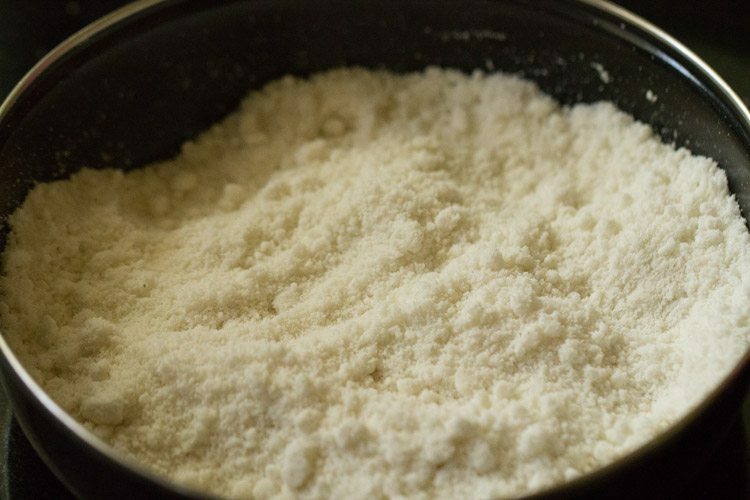 break all the tiny lumps in the flour with your fingertips. 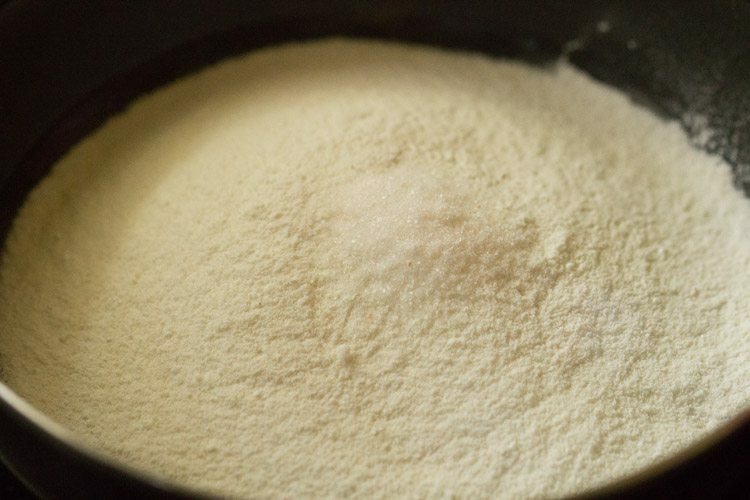 you can even grind this rice flour mixture in a grinder to break lumps. 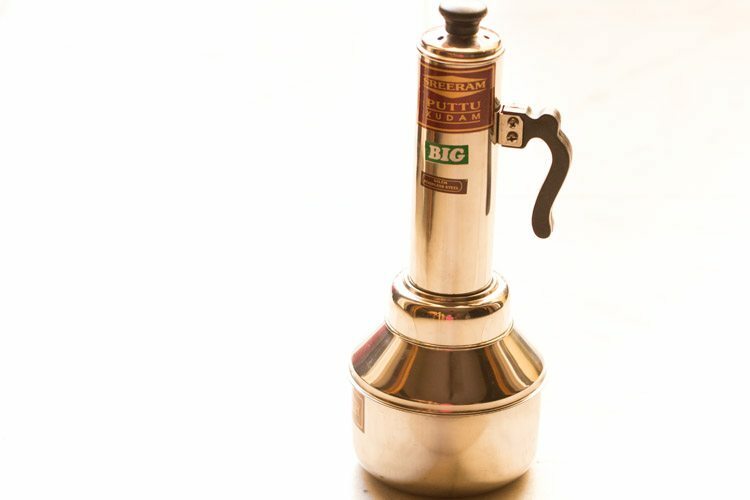 but grind in small batches and use the pulse option of mixer-grinder. now pour 2 cups water in the base vessel of the puttu kudam. keep on stove top and let it get heated. meanwhile first place the perforated disc inside the cylindrical vessel. 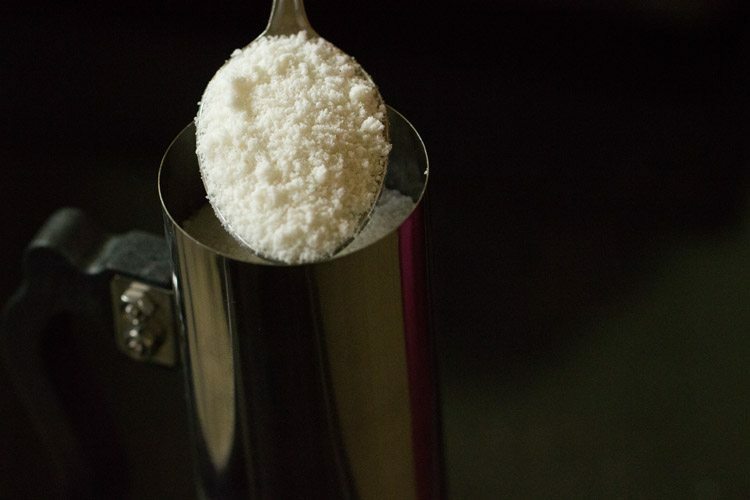 then add 2 to 3 tablespoons fresh coconut in the cylindrical vessel of the puttu kudam and spread evenly. then gently add the puttu flour till it reaches half of the cylindrical vessel. again add 2 to 3 tablespoons of grated coconut and spread evenly. then add the puttu flour again. cover the top portion with 2 to 3 tablespoons of grated coconut and spread evenly. cover with the top lid. 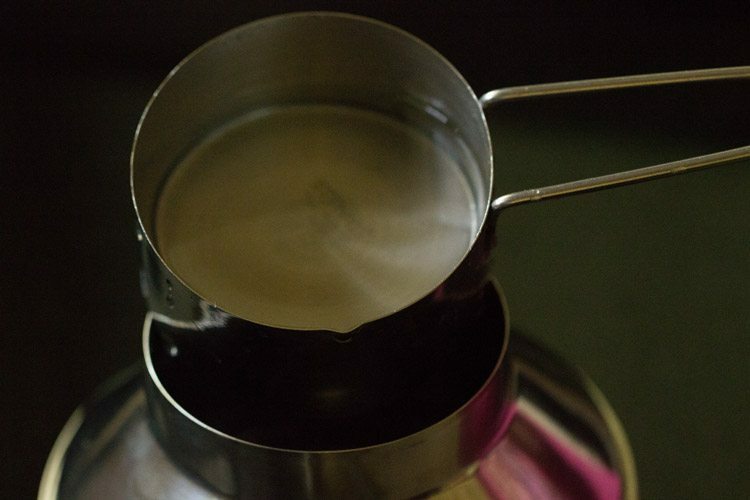 place the cylindrical portion on top of the base vessel in which the water must have come to a boil. 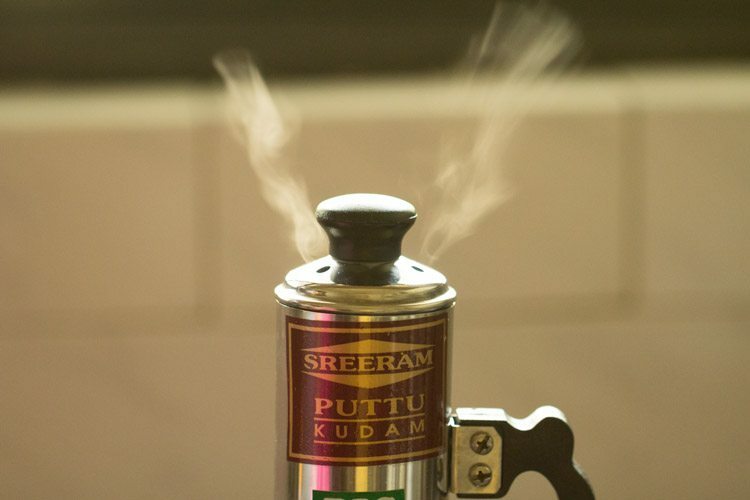 steam puttu on medium flame till you see steam releasing from the top vents of the cylindrical vessel. then switch off the flame. 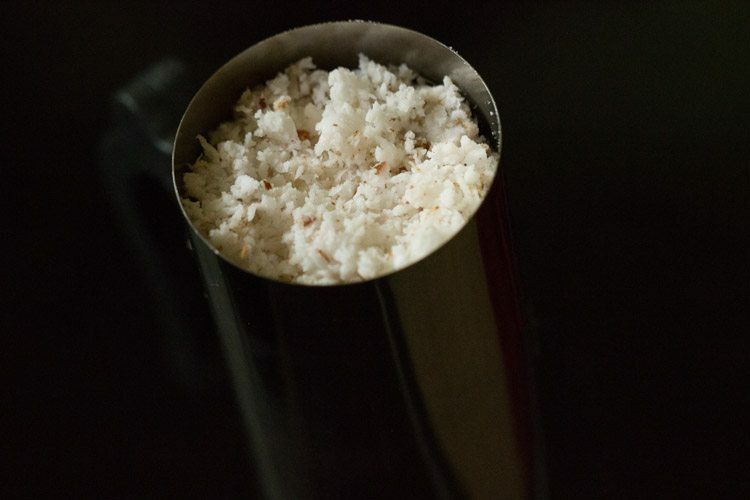 remove the cylindrical part from the bottom vessel and allow the puttu inside to cool for 3 to 4 minutes. then using a wooden skewer or the stick that accompanied the puttu kudam, remove the steamed puttu. serve puttu hot or warm with kadala curry, veg stew or potato stew. it will also go well with south indian chana masala. 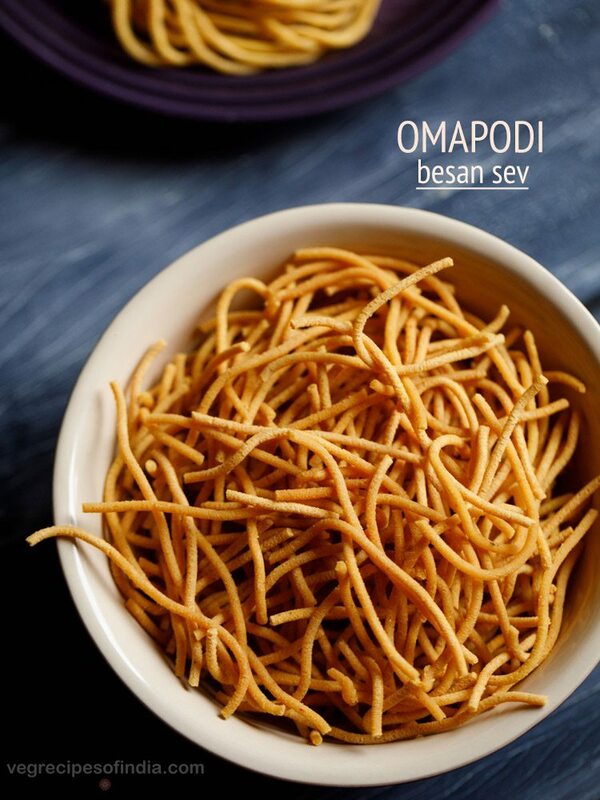 1. take 1 cup puttu flour in a mixing bowl or a pan. 2. add ⅓ teaspoon salt or as required. 4. now sprinkle ⅓ cup water all over. 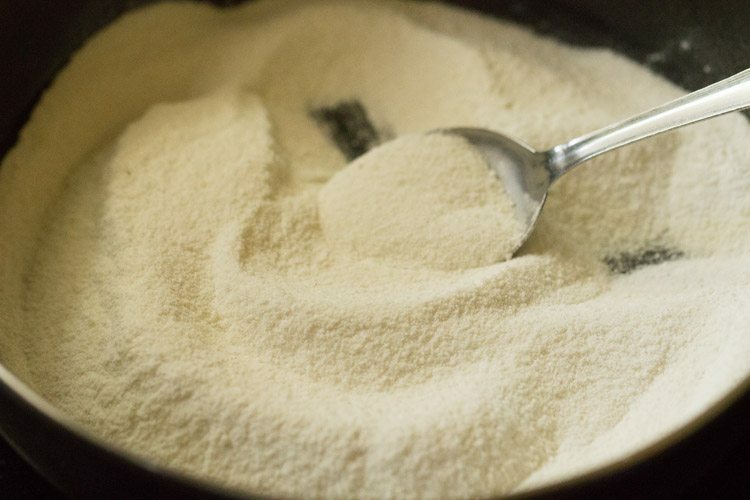 the amount of water required will depend on the quality of rice flour. so you can add accordingly. 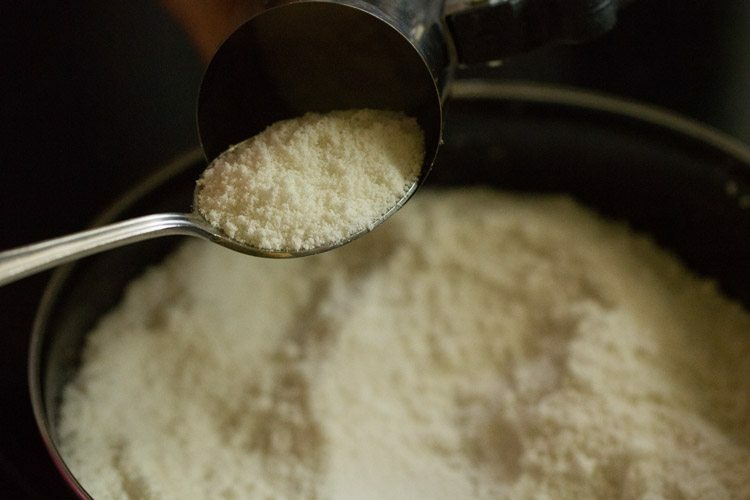 5. begin to mix the rice flour with the water with your fingertips. 7. to get soft puttu, the amount of rice flour to water ratio is important. to check this gently press a small portion of the flour between your palms. it should form a lump. when you press this flour lump more, then it breaks and crumbles. 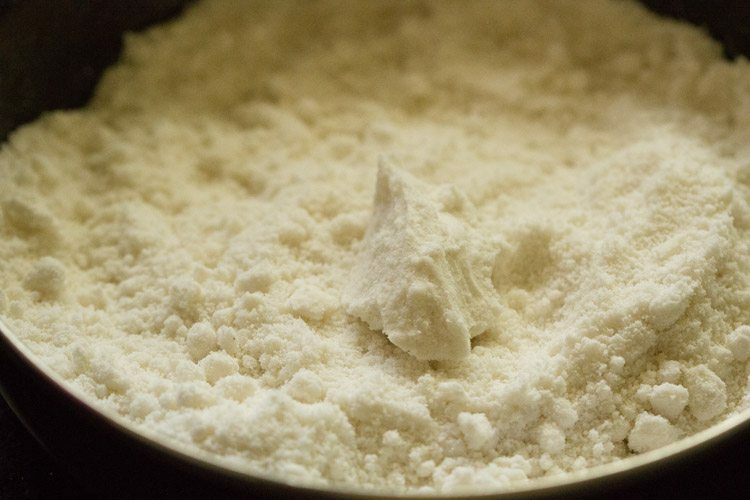 this should be the texture of the flour. 8. break all the tiny lumps in the flour with your fingertips. 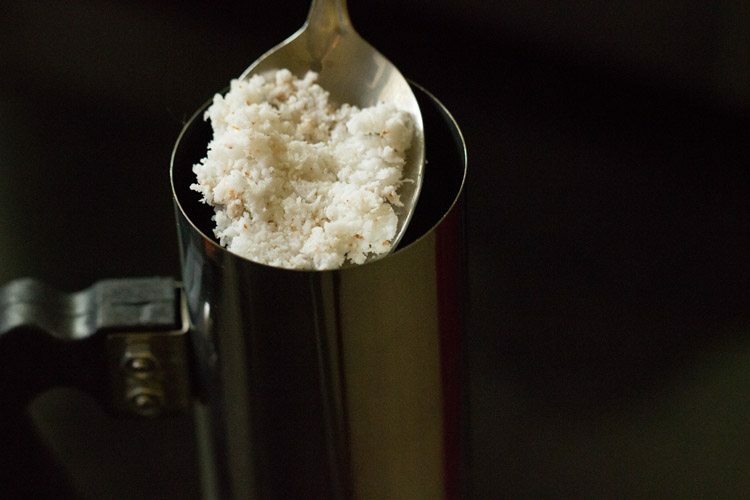 you can even grind this rice flour mixture in a grinder to break lumps. but grind in small batches and use the pulse option of mixer-grinder. 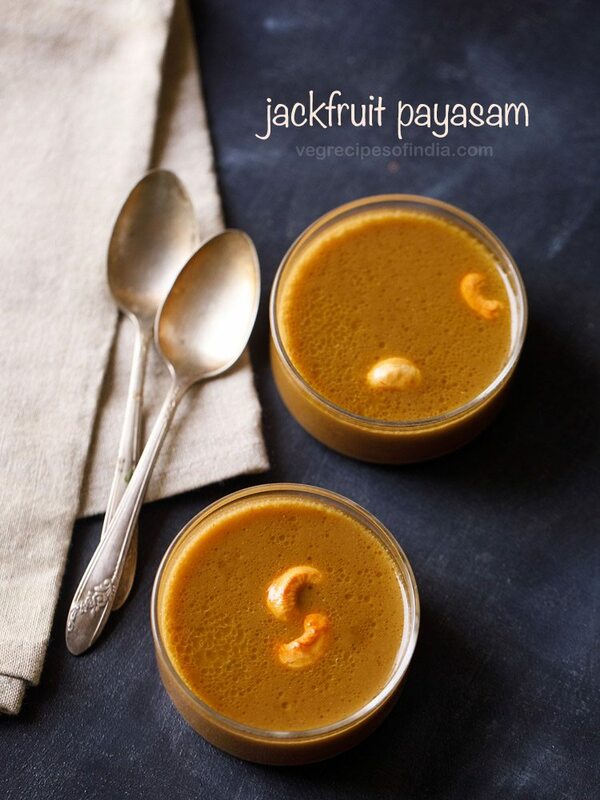 9. now pour 2 to 3 cups water in the base vessel of the puttu kudam. 10. keep on stove top and let it get heated. 11. meanwhile first place the perforated disc inside the cylindrical vessel. 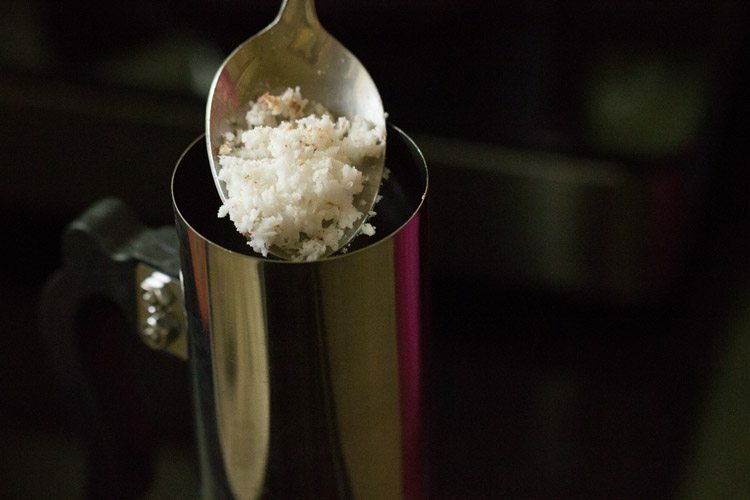 then add 2 to 3 tablespoons fresh coconut in the cylindrical vessel of the puttu kudam and spread evenly. 12. then gently add the puttu flour till it reaches half of the cylindrical vessel. 13. then again layer with 2 to 3 tablespoons of grated coconut and spread evenly. 14. then add the puttu flour again. 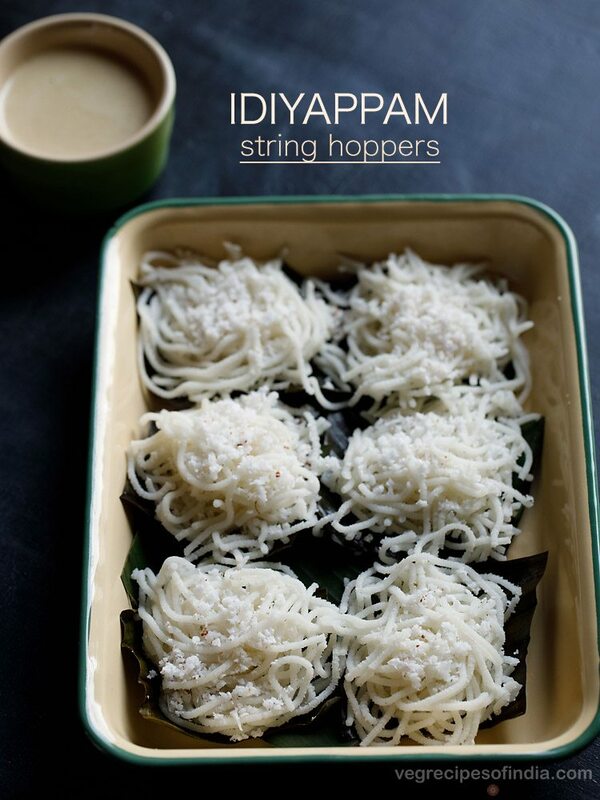 15. cover the top portion with 2 to 3 tablespoons of grated coconut and spread evenly. cover the top with the lid. 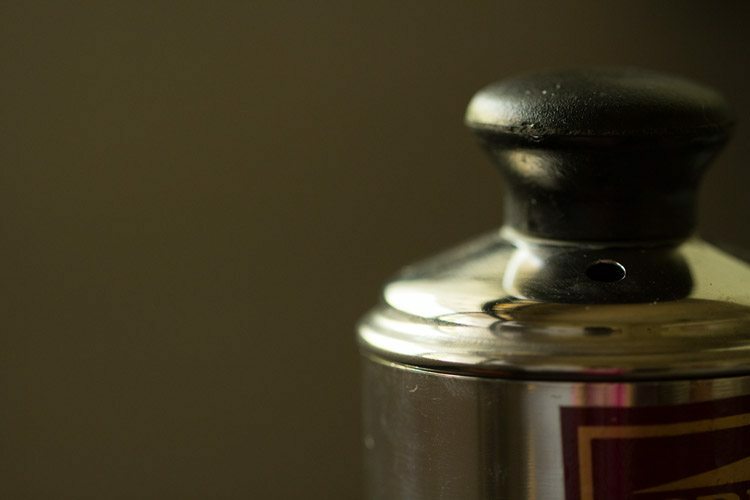 16. place the cylindrical portion on top of the base vessel in which the water must have come to a boil. 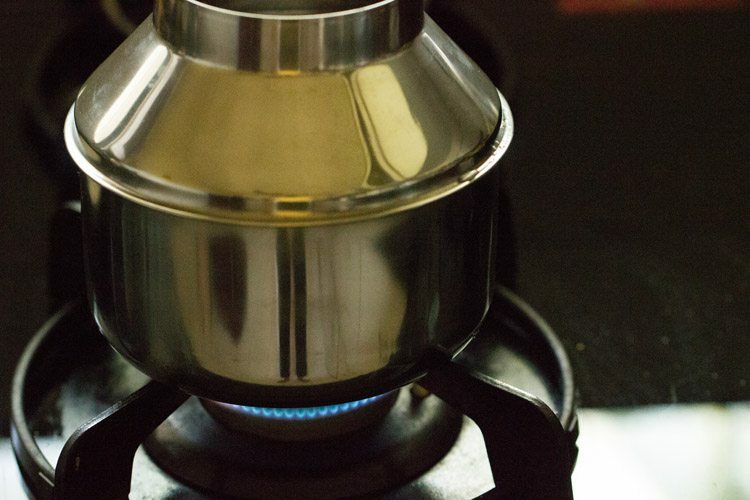 17. steam puttu on medium flame till you see steam releasing from the top vent of the cylindrical vessel. then switch off the flame. it took me about 9 minutes as i have used a large puttu maker. 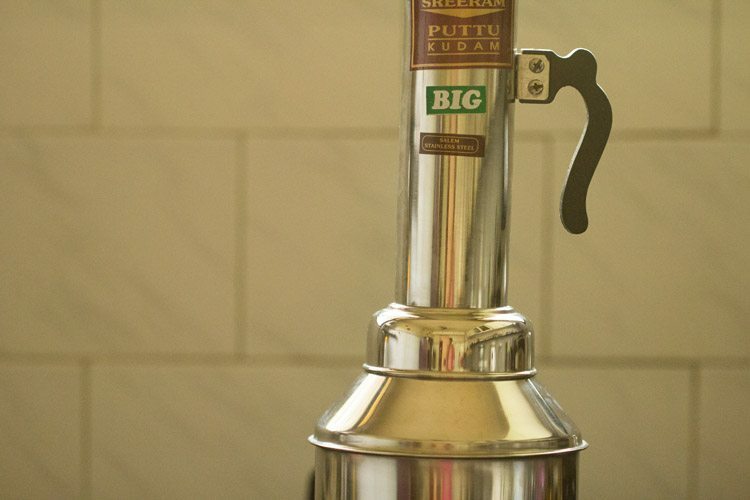 if using a medium sized puttu maker or regular puttu maker, the time will be about 5 to 6 minutes. 18. remove the cylindrical part from the base vessel and allow the puttu inside to cool for 3 to 4 minutes. 19. then using a wooden skewer or the stick that accompanied the puttu kudam, remove the steamed puttu. 20. serve puttu hot or warm with kadala curry or veg stew or potato stew. it will also go well with south indian chana masala. also serve some bananas and pappadums by side. I just returned back to California after spending 5 days in Kerala. I feel in love with Puttu. I ordered a Puttu maker that arrived yesterday along with Puttu flour. This morning I followed your recipe and I felt like I was back in Kerala. Amazing! I made kadala and served it with bananas and a bit of jaggery sugar. Thank you for sharing and easy step by step guide. Yum!!!! Welcome Heidi. Glad to know that this recipe helped you to make puttu at home. 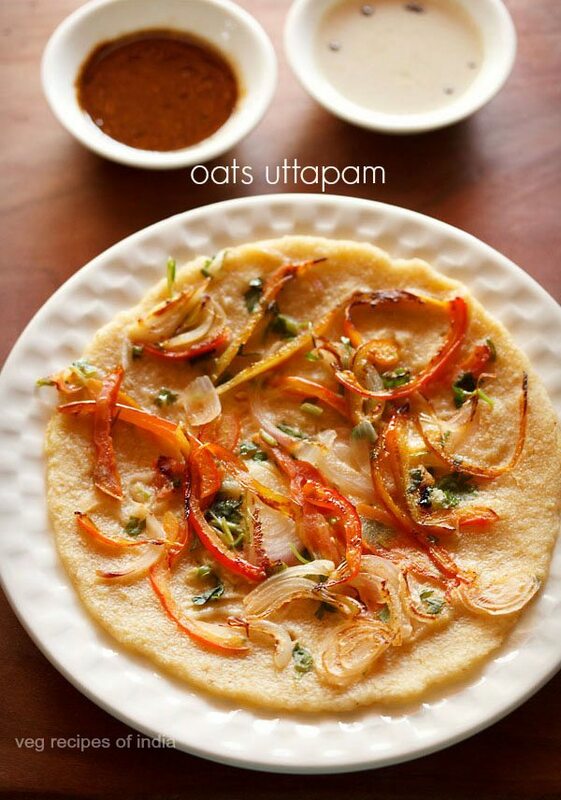 Though I am a north indian but this is one of my favorite breakfast recipes..actually i can eat it anytime.. going to buy a puttu maker and puttu podi soon. Thank you so much for the clear instructions! can’t wait to try it. btw, puttu tastes amazing with ripe mangoes also! thanks aru. its my favorite breakfast too. i am sure with ripe mangoes puttu will taste amazing.